Do you require Mercedes repairs, servicing or diagnostics? When you’re looking for a Mercedes specialist, come to the experts at Automotive Solutions. We have over 25 years of experience with Mercedes vehicles and can cover all models, no matter how old. So if you need help with an MOT, or your annual service, we are happy to help. Just call us on 01292 618798 to book your vehicle in at our garage. We are based at Heathfield Industrial Estate in Ayr and welcome enquiries from all over Ayrshire for your convenience. Competitive rates are available on all of our work and you can even save up to 50% on servicing through us rather than your main dealer and, what’s more, it won’t affect your warranty. Our garage is open from 8.30 am - 5.00 pm Monday to Thursday and opens on Friday 8.30 am - 4.00 pm, just contact us to find out more and to arrange a visit. We are well known throughout the region thanks to the impeccable standard of our work and you can rest assured that when you bring your Mercedes to us you’ll get nothing but the very best service for a fair and competitive price. 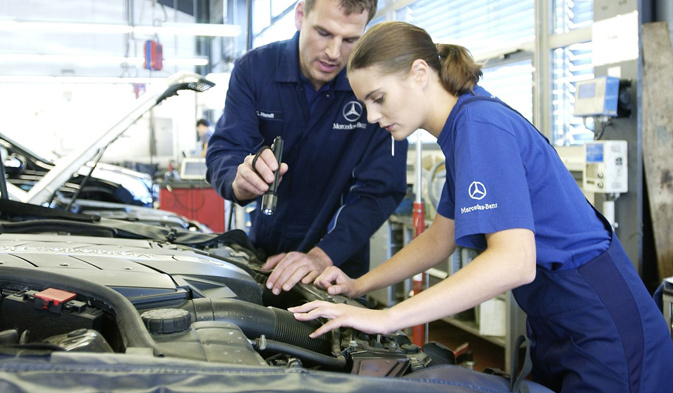 Do you require Mercedes repairs, servicing or diagnostics? When you’re looking for a Mercedes specialist, come to the experts at Automotive Solutions.